In a conference, 8 People sit in a round table all pointing inwards .They are A,B,C,D,E,F,G and H.
3 people out the 8 people always lie .While others always speaks truth . A : One of my neighbor is liar and other neighbor is not C .
B : One of my neighbor is also a liar and my opposite person is F .
C : I am not a liar and my opposite person is E .
D : Both my neighbors are liars and even my opposite person is liar . E : My neighbors are C and G .
F : My opposite is B and one of neighbor is a liar . G : One of my neighbor is a liar and my opposite is also a liar . H : My neighbors are liars . What is the sitting arrangement ? and Who are the liars ? Sequence A, B, C, D, E, F, G, H (so just clockwise (or counter-clockwise, doesn't matter) in order). 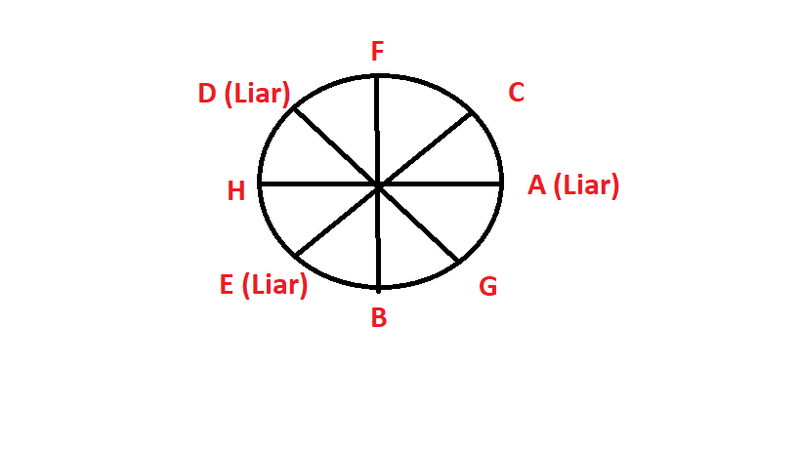 Liars are C, E and H.
I assumed that everyone was telling the truth, unless their statements are contradictory to something someone else already said, going through the statements from A to H. Like that, I found the first contradiction in C's statement (E isn't his opposite person, G is, and thus he IS a liar and lies on both occasions), the second one in E's statement (his neighbors aren't C and G, but D and F) and finally H's statement that his neighbors A and G are liars is also false. Everyone else tells the truth. I assumed B and F are speaking truth. Then a bit of hit and trials with H. As if H was speaking truth he could take only 2 places. Placing him on each. It was easy to walkthrough. Telling the truth or lying?